Awwwww. Remember baby's first word? Remember the first time you kissed your soul mate? Remember reading The Prophet for the first time - and the first person you gave it to afterwards? Remember your first adult beverage? Scratch that one. Remember your first trip away from home? Remember Mr. Projector! Episode 1, "The Mistakes We Make"? Well, someday, you'll look back on everything you've ever accomplished that made you feel complete; and suddenly - quite unexpectedly, in fact - in a moment of sublime self reflection and pride, you'll say aloud (perhaps in a crowded bar or noisy office - perhaps even to a perfect stranger on the street), you'll say, "I remember ThinkStream Films' first Press Release...." And everyone around you will nod in silent agreement, understanding. Or maybe they're just nodding because they think you're an alcoholic nut case for staring starry-eyed into your drink and mumbling to yourself. In any case, ThinkStream Films is proud to announce our very first Press Release for print and broadcast media. Here is a sneak peak. You can download the complete PR forever via the link over there on the left. See it? No? Uh-uh. That's not it. Yeah. Up a little.... Nope. Not there - okay, down just a little - yeah, that's it! Whew! Thanks to all our contributors for helping to jump-start our year with power-house strategic planning, amazing coaching, and stellar tech support! You all know who you are! Now! "Let's get those reels a-rolling!" Mr. Projector! Episode #10: "The Russians Are Here! The Russians Are Here!" "The Russians Are Here! The Russians Are Here!" Mr. Projector has been abducted by two men (presumably under suspicion of being a communist spy), according to Libby Trapp, field reporter for Channel 27 KRBZ News! One of the suspects is incredibly tall, and the other - well, pretty damn short. Subscribe to the Mr. Projector! video podcast through iTunes by clicking the iTunes button on the side bar (on the left). 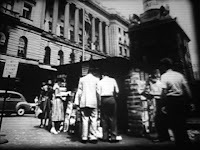 Bid on the complete, original 16mm print on eBay through 1/23/07! 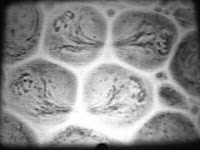 This amazing find of a film brings together for the first time then Director of the California Academy of Sciences Dr. Robert Miller, who incidentally "discovered" a new species of Alona Baird in the 1930s (as documented by the American Microscopical Society), and the now famous Kurt Michel, the first person to apply the phase contrast method to the presentation of chromosomes in live cells. 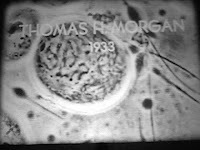 This is more Michel's film - his magnum opus, if you will - than Miller's however, as it brought to the public for the first time ever, time-lapse microscopy of living cells. 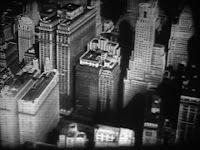 When viewed in context, this film's images produce chills of amazement. We here at ThinkStream Films wonder in awe how much more powerful this film was when viewed for the first time by the micro-sciences community. This was Star Trek before there was Star Trek. This was the apex of a time when the microcosm was our focus of exploration - before we were jettisoned (after a 180-degree spin) into the macrocosm of space exploration in the fifties. This was the new frontier. 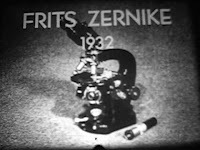 This film represents nothing less than the very horizon of scientific achievement. And one man brought it to us. His name was Kurt Michel. As a final note, we can't help but appreciate the temporary "production" name attributed to this important scientific offering, "Phase Films," an obvious direct reference to the phase contrast method used by Michel. 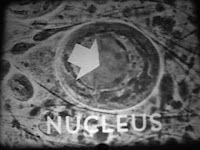 This wonderful film is one of the last remaining testaments of Michel's work at the time (we've not seen another print) and deserves immediate preservation to hold its rightful place as one of the most significant early documents in the ever-growing body of research in the fields of genetic and microbiology science. 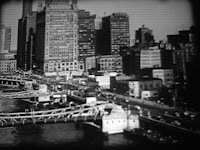 Highlights clip edited to a fraction of film's original ten minute running time. The Penalties of Urban Living! 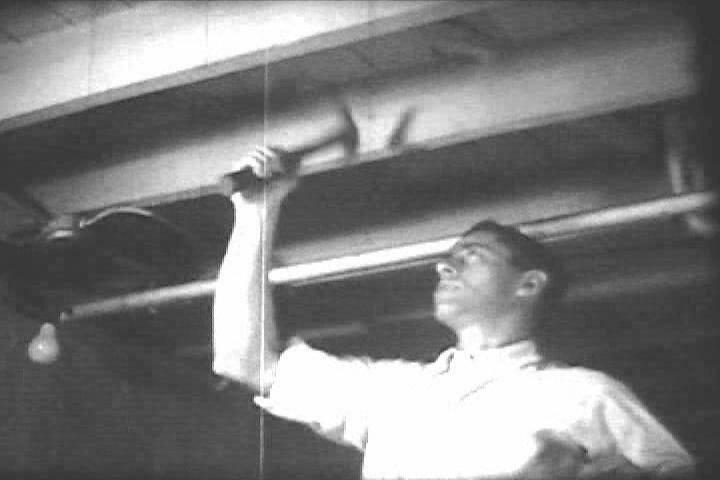 Bid on the complete, original 16mm print on eBay through 1/19/07! Well. 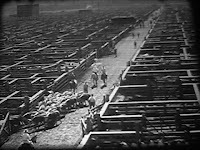 For all you urbanites forced to shoulder the heavy burden of taxes, education, city government, noise-air-and-water pollution, traffic, claustrophobic housing, tourists, psychotic taxi drivers who look (and behave) uncannily like clones of a young Robert De Niro, and overall daily mayhem, this film is for you! But "with proper planning," the narrator pipes hopefully, someday we'll be able to have our cake and eat it too (all math withstanding). Or something like that.... What they didn't know then was that the very title of this film was an unintentional euphemism for the phenomenon we now understand as urban sprawl. This rare EB print was one of several post-war film efforts to massage the urbanite masses (those who didn't join the suburban exodus that served as incubator to the baby-boom) into a more hopeful, optimistic mental space (albeit overpriced and overcrowded). "And this too," we can imagine our narrator adding, "shall pass...."
Would You Allow Your Child to Do This?! Bid on the complete, original 16mm print on eBay through 1/17/07! ....He wants to grow something in soil he makes himself." To learn about soil, the narrator of the film carelessly instructs Bobby to do that which no parent on earth would allow their child to do - climb 50,000 feet up jagged rock to explore the altitude's effect on soil! (Of course, our wonderful ThinkStream editors did a number on this clip, mixing in footage of Bryce Canyon, Utah, from the same film, for fun)! At the end of the film, Bobby replicates Bryce Canyon in his kitchen in a scene that surely influenced the famous kitchen scene in Close Encounters! 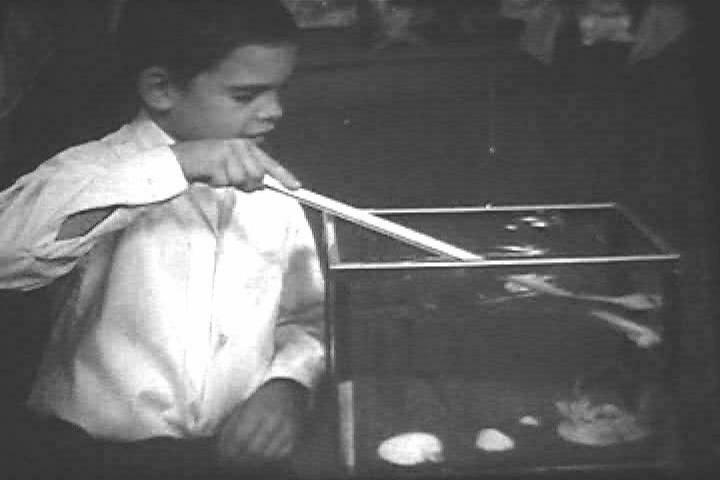 This wonderful film from FILMS INCORPORATED was an early attempt to mix the concepts of independent exploration and science in educational films targeted to young learners - a formula that remains effective to this day. It's for REEL! We now have our very own (tiny division) of the World Wide Web! ThinkStream Films has registered its domain! For you non-computer geeks, what that means is we now have ownership of the Internet URL: www.thinkstreamfilms.com! Please update your bookmarks to reflect this new Web address. 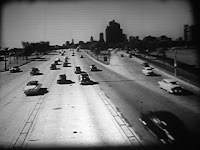 For now, it will redirect you to this blog; but as our popularity grows (and boy, is it growing! ), we will be developing an Internet presence through our official site - and you don't want to be left behind, do you? So - take some time to update your bookmarks and shortcuts to www.thinkstreamfilms.com. As our web developers begin the daunting task of building our website, you will be among the first to see it's birth and evolution! Bid on the complete, original 16mm print on eBay through 1/14/07! We here at ThinkStream Films can only refer to the narrator in this wonderful film from Coronet as "Mr. 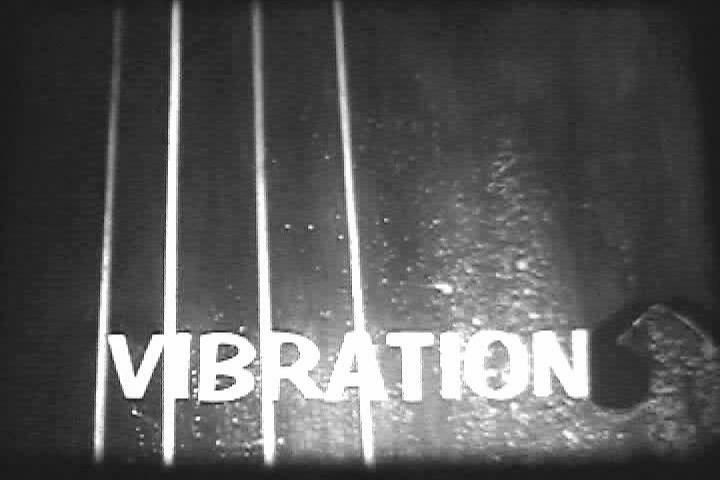 Vibration!" 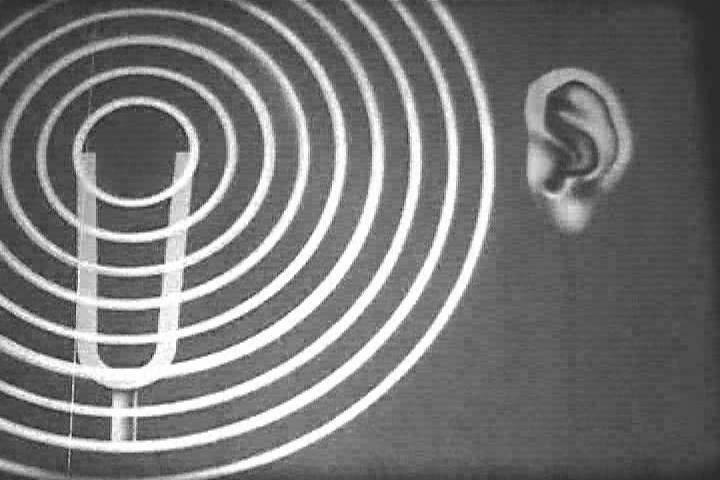 This educational gem, albeit somewhat ineffective, attempts to introduce children to the concept of sound waves. 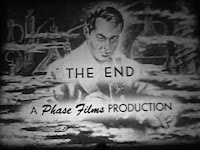 Film features a prudish and sadistically grumpy looking kitchen-mom, a total nerd with tuning forks, and the aforementioned wacked-out narrator (Mr. 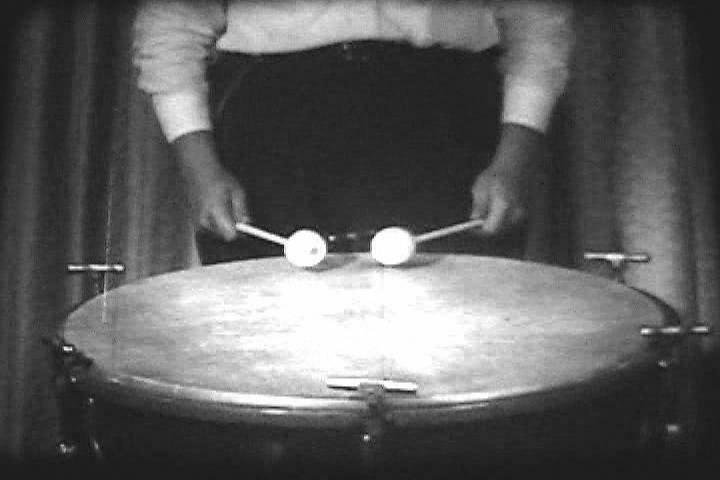 Vibration!). Our editors had fun putting the following highlights clip together. Enjoy!